Note on rankings used throughout this post: every rank mentioned is, or should be, the CFP rank at the time the game mentioned was played. In some instances that may be the team’s final rank of the season, and in others it may be the rank at the time the game was played. Further, remember that the CFP committee’s final ranking is compiled before the bowl games and CFP, and they do not re-rank teams after the bowl season / CFP. Other relevant factors (mentioned by ESPN, but not expressly found on the CFP committee’s protocol sheet). Select the “best” team: “For purposes of any four team playoff, the process will inevitably need to select the four best teams from among several with legitimate claims to participate.” – Early in the protocol sheet the committee sets out that it is looking for the “best” teams (however, they do not necessarily define “best”). Best vs. Deserving: Later in the protocol sheet, while alluding to the selection process, the protocol sheet states: “Nuanced mathematical formulas ignore some teams who ‘deserve’ to be selected.” – Again, the committee does not define what it means to “deserve to be selected.” Do the best teams deserve it? Power Five Conference Champ Left Out: Baylor (11-1, 8-1) & TCU (11-1, 8-1) Big 12 Conference Co-Champions. Controversy involving Baylor and TCU (and Ohio State’s loss to Virginia Tech): No. 9 TCU (12-1, 8-1, 11-1 Pre-Bowl) had lost at No. 5 Baylor (11-2, 8-1, 11-1 Pre-Cotton Bowl) during the regular season (by a score of 58-61). Further, the day before the final CFP rankings were released, No. 3 TCU defeated NR Iowa State by a score of 55-3 (expecting such a win to be good enough to maintain their spot in the top four). One week after Baylor defeated TCU, No. 4 Baylor lost at NR WVU by a score of 27-41 (a loss that presumably kept Baylor ranked behind TCU for almost the rest of the season). Then, the day before the final CFP rankings were released, No. 6 Baylor defeated No. 9 Kansas State (at home) by a score of 38-27 (a win that they were hoping would propel them into the top 4 and ahead of TCU, who they defeated earlier in the season). One would think that these final wins by Baylor and TCU would at least allow them hold their current positions ahead other teams, leaving only the issue of whether head-to-head would come into play as to whether TCU or Baylor should be among the top 4 teams and thus included in the CFP. Therefore, the controversy that existed before the final rankings were released was that Baylor and TCU were both 11-1 overall and 8-1 in the Big 12, however, despite Baylor having defeated TCU in the regular season, TCU was still ranked in the Top 4 and Baylor was not. The controversy increased after the final rankings were released when despite a victory in their last game, TCU fell from No. 3 to No. 6 (and out of the Top 4), while Baylor moved from No. 6 to No. 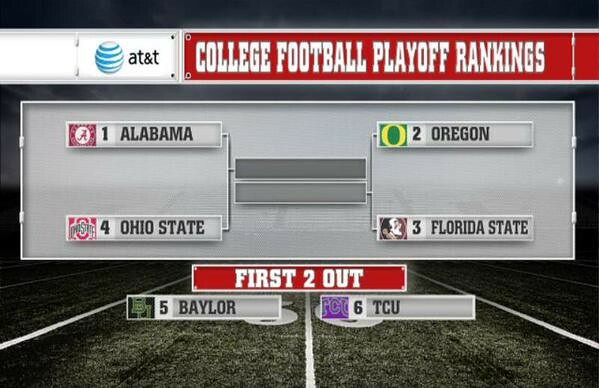 5 (thus jumping TCU due to their head-to-head win), and yet both were left out of the CFP as Ohio State moved from No. 5 to No. 4 after defeating No. 13 Wisconsin in the Big 10 Championship game. Most people assumed that there was no way Ohio State would be able to jump into the top 4 even though they were the Big 10 Conference Champion because that would require them to jump both Baylor and TCU, Big 12 Co-Champions, both of which had similar or better records (like TCU who also had only one loss, like Ohio State, but TCU’s loss was to Baylor while Ohio State’s was to Virginia Tech). In other words, most people assumed that Ohio State’s 21-35 home loss to Virginia Tech (7-6, 3-5) should have been sufficient to keep them out of the CFP, and allow for Baylor or TCU to take the No. 4 spot (with the only discussion being whether it should be Baylor or TCU). So what did we learn here? We learned that head-to-head considerations will be taken into account in the final rankings. Ohio State: As you will read in other sections for this 2014-2015 year, many people did not believe Ohio State should have been in the CFP. However, those critics were silenced when Ohio State won the CFP. When Ohio State made the 2016-2017 CFP, again under interesting circumstances, those critics began again as it felt like the committee made unprecedented moves in order to get the Buckeyes into the CFP. These critics got even louder in 2017-2018 (before the final rankings were released) when the committee was trying to decide between Alabama and Ohio State as the fourth team in the CFP. Many felt like that if Ohio State got in, it would be a third move by the committee to do whatever it took to get Ohio State in. However, the committee opted for Alabama, a decision you can read about below under the section for 2017-2018. The Vault: Ohio State moved from No. 5 to No. 4 in the final CFP rankings by defeating No. 13 Wisconsin (11-3 overall, 7-1 conference, 10-2 Pre-Big 10 Championship game) 59-0 in the Big 10 Championship game. This solidified the idea that conference titles must be extremely important when won in a conference championship game (and neither Baylor nor TCU had that luxury). While the 59-0 win over Wisconsin was a decisive victory and made for a compelling argument in favor of Ohio State, most people thought (as stated above) that Ohio State’s home loss earlier in the season to Virginia Tech was enough to keep them out. It would have been interesting to see if Ohio State would have still been included in the CFP if the margin of victory over Wisconsin had been smaller. So what did we learn here? That a big win in a conference championship game could potentially erase a bad-loss from earlier in the season, and that conference championships are: (1) important, (2) won’t be considered until they are actually won, and (3) that it is better to blow-out your opponent if you are on the bubble of making the CFP. Looking Ahead: See the 2017-2018 season for a follow up scenario to what happened in 2014-2015. In 2017, Ohio State was left out of the CFP despite winning their conference title game in favor of Alabama who did not play in a conference championship game. Further, in 2017, Ohio State barely defeated undefeated and fourth ranked Wisconsin 21-27. In other words, while there are some differences between the scenarios, this almost answers the question from 2014, and says that in 2014 had Ohio State not blown-out Wisconsin 59-0, they would have possibly been left out of the CFP in favor of Baylor or TCU (who did not play in a conference championship game, like 2017 Alabama). On the other hand, there is at least one major difference in these two seasons that is unaccounted for: 2014 Ohio State had one-loss, while 2017 Ohio State had two-losses, and we cannot tell at this time how this would have factored into the decision. Questions we were left with were: (1) did the lack of a conference title game hurt TCU and/or Baylor, while it helped Ohio State?, and (2) why did the head-to-head between TCU and Baylor suddenly matter when it had not in all the previous CFP rankings? Impressions: Conference championships (via a conference championship game) is considered more important than a regular conference title (i.e. Big 12, no title game). Also, head-to-head is not important to the committee until the final rankings are released, however, at that point in time, head-to-head will be trumped by a conference champion who won a conference championship game. Strength of Schedule: While the conference championship was the focal point of the argument between Ohio State and TCU/Baylor; the underpinning of the argument was that Ohio State also had a harder/tougher strength of schedule. FCS Teams: FSU played the Citadel, Oregon played South Dakota, Alabama played Western Carolina, Baylor played Northwestern State, and TCU played Samford. The only team that did not play an FCS school was Ohio State. The Aftermath: No. 5 Baylor then lost the Cotton Bowl to No. 8 Michigan State (Big 10 East Division Champion) 42-41; while No. 6 TCU defeated No. 9 Ole Miss 42-3 in the Peach Bowl. Some pointed to these games as proof that Baylor should have been left out while maybe TCU should have gotten in. However, most of this discussion was dropped when Ohio State, who took the No. 4 spot, when on to win the fist CFP National Championship, and arguably proving that Ohio State was the proper choice for the fourth spot. Who did they lose to? : Ohio State lost to Virginia Tech (7-6, 3-5), Oregon lost to Arizona (10-4, 7-2), and Alabama lost to Ole Miss (9-4, 5-3). Is the CFP harming the regular season? : A lot of people argued that the CFP was harming the regular season due to the fact that the committee had TCU ranked ahead of Baylor during all of the rankings except the final one. It was clear to some that the TCU vs. Baylor ranking was simply corrected in the final rankings, to reflect the regular season head-to-head victory, once the CFP committee had decided to leave them both out of the CFP. While this, in and of itself, may not cause any harm to the regular season, it will, as you will see in the near future, cause the Big 12 Conference to create a Big 12 Championship game despite already playing a round-robin schedule (a decision that is purely based purely off of the CFP yet makes no sense for the conference itself). Highest Ranked Group of Five: In the final rankings, Boise State (11-2) was the highest ranked group of five team at number 20. Stanford (Pac 12 Champion/Rose Bowl Champion) (12-2 Overall, 8-1 Conference, (11-2 Pre-CFP) – Early loss at Northwestern was argument for keeping them out of CFP. Power Five Conference Champ Left Out: Stanford (12-2, 8-1, 11-2 Pre-Rose Bowl). Allegedly the loss to Northwestern in first game of season is what kept them out, as they loss to Oregon as well and had two regular season losses. To date, no team had made the CFP with more than one loss. The Aftermath: No. 6 Stanford played No. 5 Iowa (Big 10 West Division Champion) in the Rose Bowl and won 45-16 (arguably confirming the idea that Stanford should have been allowed into the No. 4 spot instead of Oklahoma, as Oklahoma was crushed by Clemson 37-17). This Rose Bowl loss also confirmed that Iowa was rightfully removed from the No. 4 spot after their loss to Michigan State in the Big 10 Championship game, even though the loss to Michigan State was Iowa’s first loss of the season. Conference Championship vs. More Losses: While Stanford was a Conference Champion, and won their title via a conference championship game, they were left out of the CFP in lieu of the Big 12 Champion (Oklahoma). The prior season told us that winning a conference championship via a championship game would be considered more valuable than a conference title won without a championship game, however, that “rule” would have applied (possibly) to Stanford/Oklahoma, however, Stanford had two-losses while Oklahoma had only one. However, one could argue (and Stanford proponents did) that Stanford had made up for this extra loss by playing one more game (a conference title game) than Oklahoma did (just like last season when Ohio State played one more game, in the conference championship, than TCU or Baylor did). This argument did not carry the day for Stanford and thus playing an extra game in the form of a conference championship did not help vault them into the CFP above Oklahoma due primarily to the fact that Stanford had two losses instead of one. Again, this is somewhat confusing as last season it was the extra conference championship game that allowed Ohio State to pass over both Baylor and TCU in order to land in the CFP at No. 4. However, the impression we were left with was that while all three were conference champions, and all three had only one loss on the season, Ohio State pulled ahead due to picking up an extra win via its conference title game and moving to 12-1. In other words, all three had one loss, but Ohio State had 12 wins, while Baylor and TCU had only 11. (Further, Ohio State won its Big 10 championship game over a good Wisconsin team in very convincing fashion). The rule we thought that could be taken from this season was that if two teams had the same number of losses (one or less), but one team had an extra win via a conference title game, that extra win would be the deciding factor for who gets into the CFP. However, the extra win in a conference title game would not be enough if the other team had fewer losses. The Vault: Michigan State moved from No. 5 to No. 3 in the final CFP rankings, jumping over Iowa (who fell from No. 4 to No. 5) and Oklahoma (who fell from No. 3 to No. 4). Michigan State was vaulted two spots partly due to their win over No. 4 Iowa (12-2, 8-0) in the Big 10 Championship game, by a score of 16-13. They presumably jumped over Oklahoma as well, due to the fact that Oklahoma didn’t play anyone on that same weekend due to the lack of Big 12 Championship game. This again solidified the idea that conference titles are extremely important when won in a conference championship game. Strength of Schedule: Again, the underpinning of this argument of number of losses versus conference championship games is the idea that strength of schedule is fairly important. FCS Teams: Clemson played Wofford (5-6, 3-4) and Alabama played Charleston Southern (10-3, 6-0). However, Michigan State, Oklahoma, and Stanford did not play any FCS teams. Who did they lose to? : Alabama’s one loss was to Ole Miss (10-3, 6-2), Oklahoma’s one loss was to the University of Texas (5-7, 4-5), and Michigan State’s one loss was to Nebraska (6-7, 3-5). Non-Conference Champion: Ohio State is the first non-conference champion to make CFP. Penn State (11-3 Overall, 8-1 Conference, 11-2 Pre-Rose Bowl) was the Big 10 Champion (and Big 10 East Division Co-Champion, due to having defeated Ohio State during the regular season). Power Five Conference Champ Left Out: Big 10 Champion Penn State (11-3, 8-1, 11-2) and Big 12 Champion Oklahoma (11-2, 9-0, 10-2). Oklahoma was No. 7 in the final CFP rankings, and defeated No. 14 Auburn in the Sugar Bowl. The Vault: There was no vault this season, as No. 1 through No. 4 were the same four teams when the final CFP rankings were released. The only difference is that when the final rankings were released, the teams had been slightly reshuffled (as No. 2 Ohio State fell to No. 3, and No. 3 Clemson moved up to No. 2). Clemson’s move was arguably due to their 42-35 win over No. 23 Virginia Tech (10-4, 6-2) in the ACC Championship game, while Ohio State did not play that weekend (as they were not in the Big 10 Championship game). However, the move that everyone was curious about was whether No. 5 Michigan (10-3, 7-2, defeated Penn State in regular season, but lost to Ohio State), No. 6 Wisconsin (11-3, 7-2, Big 10 West Division Champion, lost to Penn State in Conference Championship game, and lost to both Michigan and Ohio State in regular season), or No. 7 Penn State (Big 10 Conference Champions, but lost to Michigan yet defeated Ohio State in regular season) would jump into the No. 4 spot (thus pushing Washington out of the top four). This potential vault, and the lack their of, caused the following analysis regarding SOS vs. Conference Championships, etc. Strength of Schedule vs. Conference Championship: Up until this season, everyone was under the impression that (1) conference championships and (2) strength of schedule were extremely important considerations for which teams would be selected for the CFP. However, the decision to take Washington over Penn State called this method of thinking into question. While the first CFP told us that conference titles were more important than anything else, this season told us something different. Not only did Ohio State get into the CFP without winning a conference title of any kind, but Washington got into the CFP over Penn State. Penn State was a two-loss conference champion while Washington was a one-loss champion (both teams won their title via a championship game). However, Penn State’s two losses were against unranked Pitt (8-5, 5-3) and No. 6 Michigan (10-3, 7-2), and thus the thought was that the extra-loss kept Penn State out. However, Washington had played a weaker schedule than Penn State (which included a win over an FCS team), and thus the CFP committee effectively said that they would “punish” Penn State for playing a harder schedule and reward Washington for having played an FCS team. Strength of Schedule: While the first two seasons told us that SOS was fairly important to the determination of who got into the CFP, this season almost completely removed that rule. Some have argued that the Washington vs. Penn State discussion is no different than the Stanford vs. Oklahoma debate from the previous year. However, there are major differences between the two in that Oklahoma did not have as many wins as Stanford due to the fact that Oklahoma did not play a conference title game (while both Washington and Penn State played in conference title games). Another difference is that the decision this season was not between Washington and Penn State, as much as it was Washington and Ohio State (a non-conference champion). In other words, you had a non-conference champion (Ohio State) with one-loss getting into the CFP, as well as a 12-1 conference champion (Washington), both over a Conference Champion who had defeated the non-conference champion (Ohio State) and had a stronger SOS than Washington. However, what won the day was the second loss that Penn State had due to their more difficult SOS (compared to Washington). However, at this point, one thing is clear, two-losses will keep you out of the CFP regardless of SOS or Conference Championship. Washington and SOS: It was heavily argued that Washington’s Strength of Schedule (SOS) did not compare favorably to anyone else in the top 4 and that Washington did not belong. Washington and Penn State’s shared loss: Washington’s regular season loss was to USC, who also defeated Penn State in the Rose Bowl. The Aftermath: While Penn State did lose a close game to USC in the Rose Bowl, Washington was crushed by Alabama in its first CPF game, 24-7. FCS Teams: Washington played Portland State (3-8, 2-6), Clemson played South Carolina State (5-6, 5-3), and Alabama played Chattanooga (9-4, 6-2). Ohio State, Penn State, and Oklahoma did not play an FCS team, and Ohio State defeated Oklahoma during the regular season (the win over Big 12 Champion Oklahoma was very helpful in getting Ohio State into the CFP; showing that it might be better to beat a conference champion than be one). However, at this point, it doesn’t appear to hurt anyone to play an FCS team. Who did they lose to? : Washington lost to USC (10-3, 7-2), Ohio State lost to Penn State (11-3, 8-1), Clemson lost to Pitt (8-5, 5-3), and Penn State lost to Pitt (8-5, 5-3) and Michigan (10-3, 7-2). Is the CFP harming the regular season? : The argument was that leaving Penn State out of the CFP, despite Penn State having defeated Ohio State in their regular season match-up, was proof that the CFP was rendering such regular season victories as meaningless. Also, the fact that Penn State was the conference champion and Ohio State was not, also fueled this argument and bolstered the concern that the CFP had officially made conference championships meaningless (despite past conference championships being what propelled certain teams into the CFP). Looking Back: As you read above, this year was the first time a non-conference champion (Ohio State) was selected over the conference champion (Penn State) (who Ohio State had lost to during the regular season). In other words, the selection protocol of using championships and head-to-head competition to separate similar teams (all of which were in Penn State’s favor) were ignored due to the fact that: (1) PSU had two-losses and Ohio State had one, (2) the committee didn’t see these teams as “similar,” and/or (3) the fact that the committee felt as if Ohio State was unequivocally better than Penn State despite the fact that Penn State had defeated Ohio State during the regular season. The last time there was a major head-to-head decision in the rankings was 2014-2015, when head-to-head was the determining factor between TCU’s and Baylor’s final ranking (however, both of those teams had 11-1 records). Highest Ranked Group of Five: In the final rankings, the highest ranked group of five team was Western Michigan (13-0) at No. 15. Power Five Conference Champ Left Out: Pac-12 and Big 10. First Time for the CFP: This was the first season that two teams from the same conference got into the CFP. Those two teams were Georgia and Alabama (both from the SEC). However, there has still not been a two-loss team in the CFP, nor has a team that played for, and lost, a conference championship game, been admitted to the CFP. (I) Going into Championship weekend, the rankings were as follows: (1) Clemson; (2) Auburn; (3) Oklahoma; (4) Wisconsin; (5) Alabama; (6) Georgia; (7) Miami; (8) Ohio State. (II) The CCGs were set: (i) No. 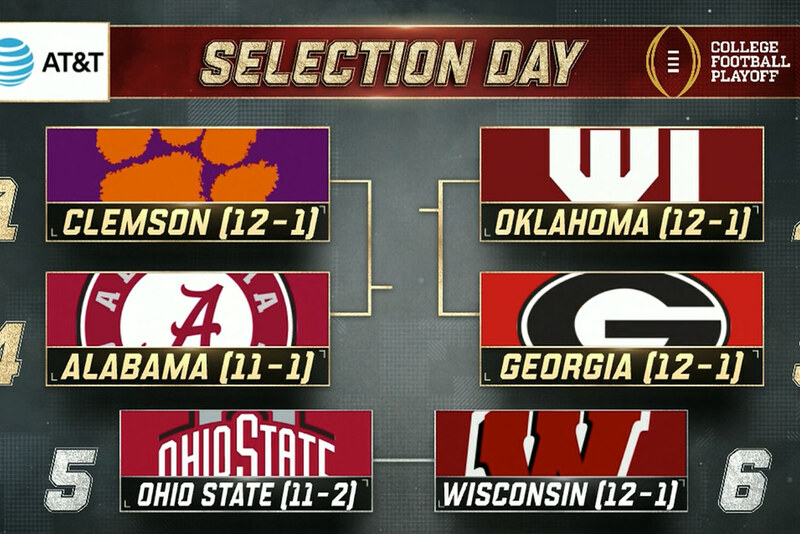 1 Clemson was set to face No. 7 Miami in the ACC CCG; (ii) No. 2 Auburn was set to face No. 6 Georgia in the SEC CCG; (iii) No. 3 Oklahoma was set to face No. 11 TCU in the Big 12 CCG; (iv) No. 4 Wisconsin was set to face No. 8 Ohio State in the Big 10 CCG; and (v) the only team from the top eight not playing in a CCG was No. 5 Alabama. (III) After the CCGs were played, (i) Clemson had defeated Miami (38-3); (ii) Georgia defeated Auburn (28-7); (iii) Oklahoma defeated TCU (41-17); and (iv) Ohio State defeated Wisconsin (27-21). (IV) The outcomes from the CCGs had most thinking that the final CFP rankings would be as follows (at least in regards to who the top three teams should be): (1) Clemson (due to their win over Miami); and (2 & 3) Georgia and Oklahoma (due to their impressive wins in both of their respective CCGs). However, the real discussion began over who would be number four (4). (V) Based on what we thought the precedent was, most people assumed that: (i) the committee would remove the CCG losers from consideration (which meant Auburn, Wisconsin, and Miami were not going to be number four; although some thought Auburn might be number four seeing that they were number 2 and only lost to number 6 Georgia; however, even at that time, most were skeptical that the committee would include Auburn due to the fact that they were a 2-loss non-conference champion that lost its CCG and could potentially face an opponent for the third time, in one season, in the CFP); and (ii) that the decision on who to place in the fourth spot of the CFP was between Alabama and Ohio State. Both of these assumptions were correct in that the committee did remove those losing teams from consideration and the fourth spot did come down to Ohio State and Alabama. (VI) However, again, based on what we thought the precedent was, everyone seemed to think that Ohio State would get in (even though Alabama probably deserved it). The arguments for this were: (i) if Ohio State was left out, that would be two years in a row that the Big 10 Conference Champion was left out; (ii) Alabama didn’t play in a CCG while Ohio State defeated No. 4 Wisconsin; the retort to which was that while Alabama didn’t play, Ohio State only beat Wisconsin by six points; and (iii) a jump from No. 8 to No. 4, and over an idle Alabama team, seemed to be in line with jumps that had been made in past final rankings. In the end, it appeared as if most figured the committee was going to move Ohio State into the fourth and final CFP spot, and leave Alabama out of the CFP. (VII) What everyone failed to take into account (or what they failed to give sufficient weight too) was that: (i) the committee values CCG winners, and they punish CCG losers, but they do not necessarily punish those who do not play in CCG games at all (see 2016 Ohio State); (ii) Ohio State had two losses on the season and (as we can see now, through the 2018 season) the committee really did not want to open the door to a 2-loss team; and (iii) the committee did not want to do a reverse course on their decision to omit Penn State from the CFP in 2016. 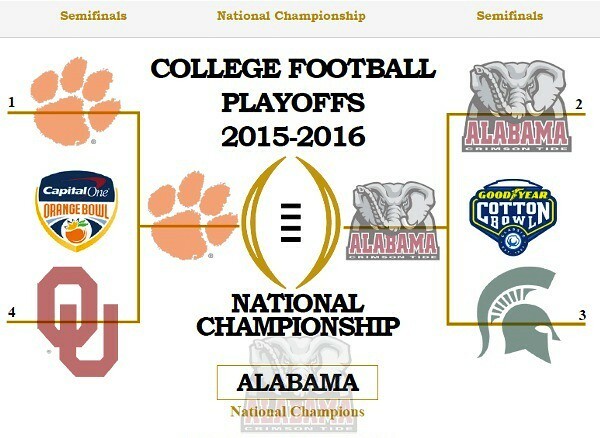 Therefore, in the end, it was Alabama who made the CFP (a team with only one-loss and that did not play in a CCG). (VIII) What about a Re-Match? : Two of the three reasons listed in the preceding paragraph also applied to why Auburn didn’t make the top four (because Auburn had two-losses, and they lost their CCG). It also didn’t help that they might face Georgia a third time, but I think this is the only time that a re-match may have factored into the decision (and so as for now, for a re-match to matter in the decision making, it would have to be a third meeting … maybe). Remove a couple of these, and I think a No. 2 team losing to a No. 6 team might still make the CFP IF the committee can get past the CCG loss. Ohio State: As you will read in other sections for this 2014-2015 year, many people did not believe Ohio State should have been in the CFP. However, those critics were silenced when Ohio State won the CFP. When Ohio State made the 2016-2017 CFP, again under interesting circumstances, those critics began again as it felt like the committee made unprecedented moves in order to get the Buckeyes into the CFP. These critics got even louder in 2017-2018 (before the final rankings were released) when the committee was trying to decide between Alabama and Ohio State as the fourth team in the CFP. Many felt like that if Ohio State got in, it would be a third move by the committee to do whatever it took to include Ohio State. However, the committee opted for Alabama. Alabama: Alabama did not win the SEC West (Auburn did), and therefore Alabama did not play for the SEC Championship (actually, Alabama was the SEC West Co-Champion with Auburn, but Auburn went to the title game to play Georgia). This meant that a non-conference champion was in the CFP (and actually won the National Title). However, fortunately for Alabama, they played Georgia (the SEC East Division Champion) in the National Title game, and while they do not have an SEC title, they were able to answer the question as to who was better (Georgia or Alabama). Alabama’s SEC record of 7-1, above, obviously does not reflect the fact that Alabama played and defeated Georgia (an SEC opponent) in the National Championship game. 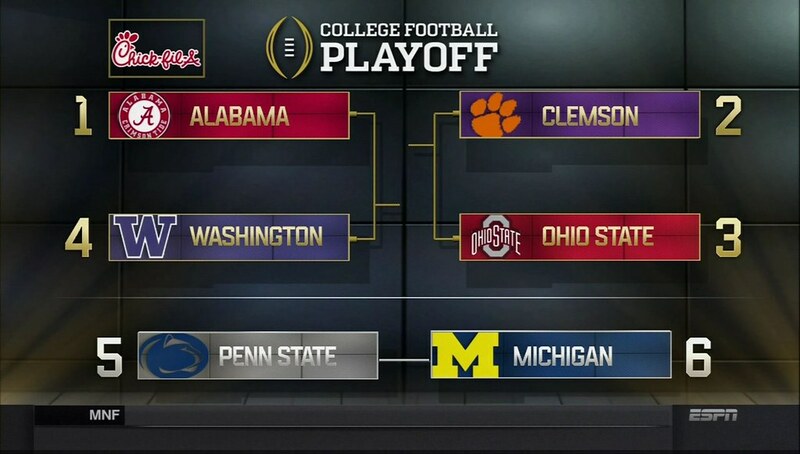 2016 Ohio State vs. Penn State: Including Alabama as a non-conference champion was not a “first” for the CFP. The previous season (2016-2017) saw Ohio State get into the CFP as a Big 10 Division Co-Champion, while Penn State (Big 10 Champion) was left out entirely. The difference between the 2016-2017 and 2017-2018 season is that in 2016-2017, the Big 10 Champion was left out in favor of the Division Champion (Ohio State); however, in 2017-2018, both the SEC Champion (Georgia) and the SEC West Co-Champion (Alabama) got into the CFP (whereas the year before, Penn State was left out). Strength of Schedule: Alabama’s SOS: OOC Schedule included (3) Florida State, Fresno State, Colorado State, and Mercer (FCS); Ohio State’s SOS: OOC Schedule included (5) Oklahoma, Army, and UNLV. Who did they lose to? : Alabama’s only loss was to (6) Auburn; Ohio State’s losses were to (5) Oklahoma and Iowa. Ohio State vs. Alabama: Some argued that a simple answer to the Ohio State vs. Alabama question was to exclude Ohio State, as they had already lost to Oklahoma (who was in the CFP). Also, see below regarding Ohio State being a two loss conference champion getting in, when the year before, two-loss conference champion Penn State was kept out. ‪2016 All Over Again – IF Auburn had won the SEC and made the CFP: If Auburn had won out and made the CFP (with two losses) as the SEC Champion (over one-loss Alabama, we would have had a result that was exactly opposite of last season when Ohio State made the CFP and Penn State (two-loss Big 10 Champion) did not. ‬The only explanation for such an occurrence would be 2017 Auburn’s SOS vs. 2016 Penn State’s SOS. Arguably, Auburn has a better SOS as their two losses were to Clemson and LSU, while Penn State lost to Pitt and Michigan in 2016 (however, Clemson also lost to Pitt in 2016). 2016 All Over Again – IF Ohio State had made the CFP: When Ohio State beat Wisconsin in the Big 10 Championship game, a lot of skeptics started to pay attention. Ohio State was a two-loss conference champion, which is exactly what Penn State was last year when they were left out of the CFP. How was anyone going to justify letting Ohio State in this year, when Penn State was kept out the year before? Precedent: SOS: With 10-1 Clemson ranked ahead of 10-1 Oklahoma, it is clear that the CFP committee’s formula for SOS is based more on a team’s wins than their losses. After all, right now Clemson’s loss to Syracuse doesn’t look as nice as Oklahoma’s loss to Iowa State. In other words, the committee must not be nearly as concerned with who a team loses to, but is more concerned with who a team defeats; and Clemson has a nice resume in that regard (several teams with above .500 records who were ranked when they played Clemson). The teams that Oklahoma has defeated are nice, but not quite as impressive as Clemson’s opponents, or at least, that is how the CFP committee is viewing it (if they are not viewing it this way, then I don’t understand how Clemson is so far ahead of OU). Click here to read Kirby Hocutt’s answers regarding Clemson and Oklahoma as this is great insight into the mind of the CFP committee (however, as we have seen before, just because they vote/think this way now, doesn’t mean they will vote this way in the final rankings). Is the CFP harming the regular season? : If Auburn and Georgia had both made the CFP, they could have potentially faced each other three times in the same season. It might have also forced a re-match between Auburn and Clemson. What the Committee will consider and how they view SOS: (1) The committee doesn’t like blow-out losses (which makes the Iowa 55-24 defeat of Ohio State interesting, especially considering that the CFP committee used big losses as a reason to keep Penn State out of the CFP last year; yet the committee would have to ignore their own logic this season in order to include Ohio State). The committee also considers: (1) teams that have earned the most wins against opponents ranked in the committee’s (current) top 25, and (2) wins against teams with records above .500. The SOS metric used by the committee is a moving target as each committee member has their own opinions regarding SOS, and SOS is one of the tiebreakers the committee must consider when ranking comparable teams (along with championships won, head-to-head results, and outcomes against common opponents (without promoting margin of victory)). The committee members are free to use statistics outside of those provided by SportSource Analytics (the data company the CFP has a contract with) — as long as they understand where they come from and how they’re compiled. In fact, the committee is given 128 different “team sheets” in their playoff binder, each filled with data from SportSource Analytics on offense, defense, special teams and SOS. The SOS is broken down into 10 different opponent categories, such as opponents’ opponents’ records, including opponents’ losses to FCS teams. The sheet also tells them the number of wins against “Current CFP Top 25” teams, and a team’s record against Power 5 opponents, as well as Group of 5 opponents. For more on the CFP committee’s selection protocol, see their “Selection Protocol” sheet HERE! Third Weekly Rankings: Until this year’s Alabama team, no team had lost a game after the release of the third weekly CFP rankings and also made the CFP. Leaving out the only Undefeated Power 5 Conference Champion: Never has an undefeated Power 5 Conference Champion been left out of the CFP. However, if Wisconsin wins out and doesn’t make the CFP, while four other teams make it in with one or two losses, it will have to be because of SOS, right? Undefeated Teams Left Out: No undefeated Power-Five teams were left out; however, UCF finished the season undefeated (12-0) and did not make the CFP. (1) In 2014-2015: Only one Power-5 Conference Champion (Big 12) was left out, but they were not undefeated (actually, Baylor and TCU were co-champions, but again, neither were undefeated and neither made it into the CFP). Further, only one team started the CFP undefeated overall, and two teams started undefeated in conference play. (2) In 2015-2016: Only one Power-5 Conference Champion (Pac-12) was left out, but they were not undefeated. Further, only one team started the CFP undefeated overall, and only one team started undefeated in conference play. (3) In 2016-2017: For the first time, two Power-5 Conference Champions were left out (Big 10 & Big 12); however, neither were undefeated and a Big 10 non-conference champion did get in to the CFP instead (Ohio State); therefore, only the Big 12 was unrepresented as a conference in the CFP (and for the third straight year, four of the five power conferences made the CFP). Note: The reasoning for leaving out the Big 10 Champion (Penn State) was that they had two losses while Ohio State only had one. Further, only one team started the CFP undefeated overall, and only one team started undefeated in conference play. (4) In 2017-2018: Two Power-5 Conference Champions were left out (Pac-12 & Big 10) again, but this time an SEC non-conference champion got into the CFP instead of a representative from the conferences that were left out, and thus, for the first time, the CFP entirely excluded two Power-5 Conferences (champions or otherwise) AND, for the first time, one conference (the SEC) had two teams in the CFP. Note: For the second straight year, the Big 10 Champion was excluded, only this time it was a 2-loss Ohio State team, and after 2016-2017 Penn State vs. Ohio State argument there was no way the CFP committee was going to allow a 2-loss Ohio State Champion into the CFP as they realized they had no argument to do so (at least, they had no argument that wouldn’t contradict their logic from the year before when they kept a 2-loss Penn State Champion out). This left everyone wondering if they would still send a Big 10 representative like they did they year before; however, that would mean sending Wisconsin (12-1) who just lost to Ohio State in the Big 10 Championship game. I think the logic was, how do you keep Ohio State out, but allow in the team they just beat? Fortunately for the committee, this part of the equation was different from the year before in that while Penn State had defeated Ohio State earlier in the 2016 season, they two teams did not meet in the Conference Championship game. Therefore, when they decided to keep Penn State out of the 2016 CFP, they could find some logic that allowed for Ohio State, as Penn State did not just defeat Ohio State in the Conference Champion game (which was the case for 2017 Wisconsin). As for the decision to send the next best SEC team to the CFP, both Alabama and Georgia had been sitting at 5 and 6 in the rankings before championship game weekend (while Wisconsin was at 4), and while both jumped ahead of Wisconsin, that is again because Georgia won their conference champion game and Alabama didn’t play in one (and therefore didn’t lose one). This left people believing that while playing in a conference championship game is important, it only helps if you win it; as losing a championship game will surely keep you out of the CFP (based on the 2016 and 2017 seasons, see 2017 Wisconsin). On the other hand, it also appeared that if you are considered second-best in your conference (2017 Alabama or 2016 Ohio State) you are better off not going to the conference championship game at all. Further, no teams started the CFP undefeated overall, and none of them were undefeated in conference play. Looking Forward (This 2018 Season): For the second straight year, two Conference Champions are left out of the CFP (Big 10 and Pac-12). It is also the second straight year that two Power-5 conferences are unrepresented in the CFP (Big 10 and Pac-12). Neither of the two Champions from the Big 10 or Pac-12 were undefeated. However, unlike the past two seasons when a non-conference champion made the CFP (and in 2016 allowed the Big 10 to still have a representative, and in 2017 gave the SEC two teams in the CFP), this year is again entirely different as Notre Dame has made the CFP as an Independent for the first time. Notre Dame is undefeated and it is unclear at this point whether being undefeated will be a prerequisite for Notre Dame to make the CFP in the future. Further, three teams are starting this CFP with overall undefeated records (which is a first) and two are undefeated in conference play (which is the most since the first CFP in 2014); however, there might have been a third undefeated in conference play if Notre Dame played in a conference. (1) If Georgia had made the CFP, they would have been the first two-loss team to make the CFP, and the first team to make it in after losing their Conference Champion game. (2) Oklahoma was ranked fifth before championship weekend, and finished the season as a 1-loss conference champion. Based on the previous four CFP decisions, it was easy for the committee to stick to precedent and do what they have done before (which in this case is to move Georgia out, and put Oklahoma in). Anything else would have caused a controversy and a lot of curiosity as to what procedure the committee was following and/or what “things” mattered to the committee. On the other hand, simply following a “plug-and-play” formula for filling out the top four of the CFP is dangerous precedent and calls into question the purpose of the committee and whether or not a committee is actually needed for this job. Having said that, while I personally think Georgia is a better team than Oklahoma, I don’t have a real problem with Oklahoma getting the fourth spot because: (i) Alabama has earned the right to not have to play Georgia again, and I don’t believe in giving teams a “second bite of the apple,” and (ii) I have never subscribed to the theory that the winner of a playoff yields the “best” team (as that only happens, or is necessary, when you have multiple teams that you can’t tell apart); therefore, since no one is trying to actually figure out who the best team is, I have no problem trying to put conference champions and 1-loss teams into a blender and seeing who comes out on top. In the end, if Oklahoma finds a way to win this year’s CFP, I don’t think many people will take it seriously anymore as I don’t believe they will be able to accept Oklahoma as the best team, and in fact, it would fast-track the CFP to becoming an eight team event (which is the exact opposite of what I think should happen in a scenario where you allowed in a team that shouldn’t be there in the first place). (3) I think Ohio State had an argument (near season’s end) that they were better than Oklahoma and should have been allowed into the CFP. However, I really don’t care for the philosophy where you ignore what happened to a team that performed poorly in the beginning of a season because they are apparently getting better, but yet you don’t give credit to a team that started off great and maintained that level of play all season long. Due to the fact that I, personally, don’t care for that philosophy, I have a hard time saying that Ohio State should have jumped over Oklahoma to make the CFP. This is especially true considering the fact that in 2014, it took defeating No. 13 Wisconsin (11-3) by a score of 59-0 in the Big 10 Championship Game for Ohio State to jump from the Number 5 spot to the Number 4 spot; and this year they played No. 21 Northwestern (8-4) in the Big 10 Championship Game and won 45-24. This year’s performance over Northwestern was not as impressive as their 2014 game against Wisconsin, and was definitely not impressive enough for Ohio State to jump two-spots from Number 6 to Number 4. Two Losses is a Complete Bar to the CFP: As of right now (with Georgia not making the CFP), the committee has set and reaffirmed a hard line precedent that two losses will bar any team from the CFP. Big 10 Conference Champions: This is the third straight year that the Big 10 Conference Champion has been excluded from the CFP. Highest ranked Group of Five Team: UCF (12-0 Overall, 8-0 Conf. & 9-0 with CCG) won their Conference Championship Game and finished the season ranked Number 8 in the CFP Rankings and as the American Athletic Conference Champions (AAC). This is the closest that a Group of Five Team has gotten to the top four and could have been a year they made it in. I would have had no real problem with putting UCF in over Oklahoma, Ohio State, and/or Michigan (who they would have had to jump to make the Number 5 spot); however, I would have had a problem putting them in over Georgia. Controversy: Not really, but: (i) That UCF didn’t make it into the CFP; and (ii) that Georgia was left out and Oklahoma was in (as most were not as impressed with Oklahoma or Ohio State as they were with Georgia. Precedent to the CFP Selection: In this section I am going to try and take what appears to be precedent, and it laid out above in the year-by-year comparisons, and boil it all down to a very simple list of precedent points. (1) Two losses is a complete bar to the CFP, especially if you have a one-loss CCG Champion sitting at number 5 or 6 (haven’t seen anything that would let a team overcome two losses). (1a) However, I think winning a CCG (especially if done in very impressive fashion) might overcome the two-loss bar at some point in the future (but the two loss team will have to be perfectly poised to pull this off, including not having a team at number 5 of 6, right behind them, who is a CCG Champion and has one loss, or less). (1b) Having said what I did in (1a), keep in mind that winning a CCG will not likley overcome two losses if the second best team in the conference has only one loss and did not play in the CCG (see 2016 Penn State vs. Ohio State, and 2017 Alabama). (2) Losing a CCG is a complete bar to the CFP (haven’t seen a team lose a CCG and still make the CFP). (2a) Losing a CCG might be overcome if you are already in the top four and it is your first loss (and it is a “good” loss). I say “might” because this scenario has not come up yet. 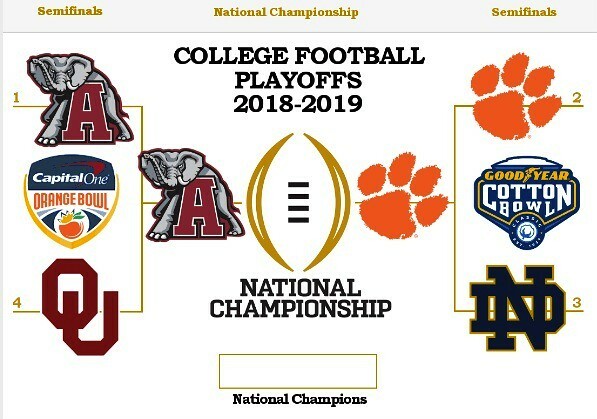 (3) Re-match games: this could be a bar to the CFP, but the only time I think it has really come up was when Auburn and Georgia could have met for the third time had Auburn made the CFP. In other words, a third re-match could keep a team out, however, we don’t know for sure because Auburn also had two losses and lost their CCG. (4) Having one team from a given conference already in the CFP, does not bar a second team from getting in. In 2017-2018, the SEC had two teams make the CFP. This was the first time that two schools from same conference made the CFP. Alabama is the only school to make all five of the CFP. There has not been a team with more than one loss make the CFP (every team in the CFP has had one or zero losses); however, this looks to likely change in 2018-2019. Every season (except 2017-2018) there has been at least one undefeated team in the CFP; however, the CFP has not yet been won by an undefeated team. A No. 1 or No. 3 seeded team has never won the CFP (all winners were seeded No. 2 or No. 4). Further, the No. 2 seeded team has won the CFP two times (and has won it back-to-back); the No. 4 seeded team has won the CFP two times (including the first CFP). Until Alabama won the CFP in 2017-2018, all winners of the CFP were also conference champions. Further, all conference champions who have won the CFP, earned their conference title via a conference championship game. Finally, when Alabama won the CFP in 2017-2018 as a non-conference champion, they did so by defeating Georgia (SEC Champion) in the CFP title game. Until that moment, Alabama and Georgia had not played that season, as Alabama did not make the SEC championship game. There has not yet been a school from the “Group of Five” in the CFP (all CFP teams have been Power Five conference schools). Notre Dame has not made the CFP, but that looks to change in 2018-2019. There has never been an undefeated Power Five conference champion left out of the CFP (all undefeated Power Five Conference Champions have made the CFP). Only teams from three conferences have won the CFP. The SEC has won it twice, the ACC has won once, and the Big 10 has won once (including the first). This means that two of the Power Five Conferences have never won the CFP, that being the Big 12 and Pac 12. Two teams from same conference: This happened for the first time in 2017-2018 when two teams from the SEC got into the CFP. The loser of a Conference Championship game has never made the CFP. 2016-2017: First time that two Power-5 Conference Champions were left out of CFP. 2017-2018: First time that two Power-5 Conferences didn’t have a representative in the CFP. An undefeated Power-5 Conference team has never been left out of the CFP. The SEC and ACC have never been left out of the CFP; and the SEC is the only conference to have two teams in the CFP at the same time. The Big 12 Conference has been left out of the CFP two times (2014 & 2016). The Pac-12 Conference has been left out of the CFP three times (2015, 2017, & 2018). The Big 10 Conference has been left out of the CFP two times (2017 & 2018); however, the Big 10 Conference Champion was excluded in 2016 (while the conference itself was not). The Big 10 Conference Champion has been excluded three consecutive years (2016, 2017, & 2018). 2017: There were no undefeated teams (overall, or in conference play) as everyone had at least one conference loss. (This is the only time it has happened). No CFP winner has been undefeated, and every winner has had at least one-loss on the season. However, the first winner (2014 Ohio State) was undefeated in conference play and is the only team to ever do this. (2018 may see that change as three teams are undefeated overall, and two of those have undefeated conference records). 2018 has the most teams in the CFP starting out with an overall undefeated records (3 teams) and ties the most (2 teams) for undefeated in conference record (from 2014). How the selection process works and past SOS Metrics! Alvarez added that the committee “screwed up” in 2014, the first year of the playoff. Baylor and TCU tied for the Big 12 title, each at 8-1, without a championship game to boost the resume of a potential victor. TCU dropped from No. 3 to No. 6 in the CFP Rankings despite winning its final game by 52 points over Iowa State. Baylor went from No. 6 to No. 5 after beating No. 9 Kansas State. Meanwhile, Ohio State slipped into the playoff ahead of TCU on the strength of a Big Ten Championship Game blowout of Wisconsin. Is there something wrong with the CFP, or is it something else? Maybe it should be expanded? Those who know me, know that I am not “pro-playoff,” and that I actually preferred the old system of polls and voting to determine a national champion. I could write an entire paper on that subject, but my reasons boil down to basically two things: (1) the winner of a playoff does not necessarily give you the “best team,” one team can clearly be better than everyone else; but with one upset in a championship game, and they fall to 14-1 while the winner could be 12-3; and (2) the CFP is not a flawed system (anymore than the BCS was), and it is the mentality of the spectators that is flawed and/or confused. A perfect example of this is after years of complaining about the objectivity of the BCS selection process and its computer polls, fans finally got what they wanted (a totally subjective playoff committee). However, now everyone wants to argue over who should get into the CFP based on metrics and computer polls, and they point to things like strength of schedule, etc. (all of which are objective things that were being considered in the BCS computer polls). Long story short, expanding the playoff doesn’t make it better and only allows more teams to get a “second bite at the apple” after already losing a crucial game in the regular season. I do not want to hear about how (in 2018-2019) Georgia should not get into the CFP if/when they lose the SEC championship game, and yet also hear, from the same people, that the CFP should be expanded to eight teams, which would allow for more teams, like Georgia, to get into the CFP after they lose their conference championship game. CFP = College Football Playoff. Bold = CFP National Champion. * = Runner-up / Lost National Championship Game. # = Conference Champion, but not via a Conference Championship Game. This entry was posted in Playoff by Travis Normand. Bookmark the permalink.